If you've got to kill some time waiting for your kids to fall asleep tonight, head on over to the Aemilia Ars website and check out the latest photos in their Gallerie of the recent show in Bologna, Mondo Creativo. 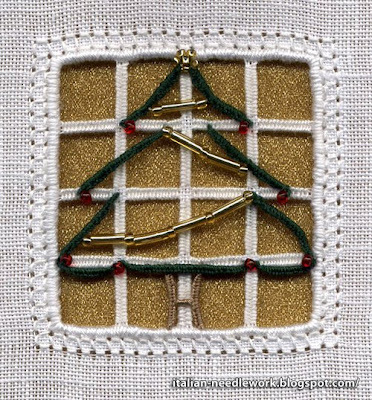 All the best to everyone for a joyous holiday and I wish you lots free time for stitching! 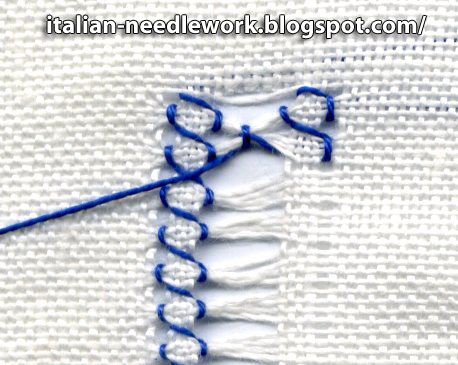 As mentioned previously, the Gigliuccio or Peahole Hemstitch has many different methods of execution. I have tried a few and all have their merits but since so many of you have asked how to do it, I will show you the way I currently like the best. I prepared a brief tutorial last year for an online friend, so I will be using that and elaborating a bit. 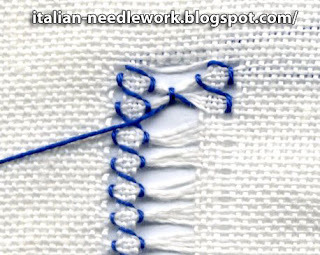 You need to prepare your channels of withdrawn thread areas for the first part of the Gigliuccio which is executed in Punto Quadro or Four-Sided Stitch. Again, there are many ways to execute Punto Quadro but I'm going to show you how I have learned it. 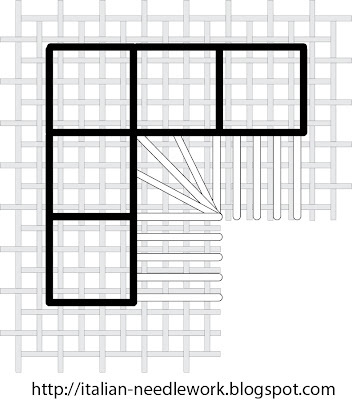 For this example we will withdraw one ground thread and skip four, withdraw 8 ground threads, skip four and withdraw one ground thread. 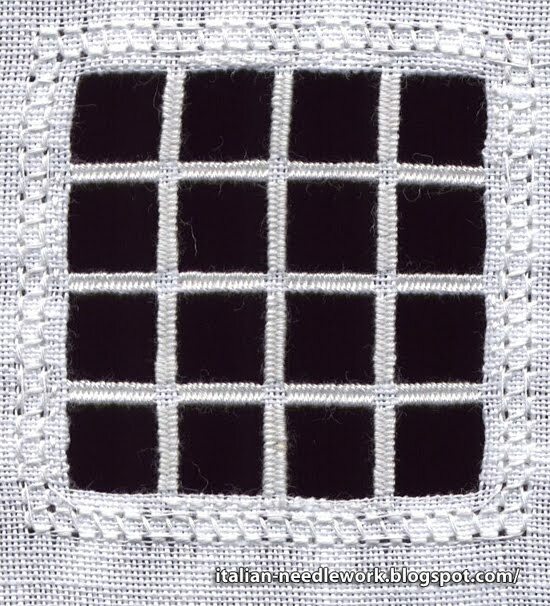 The middle part (the 8 threads) can vary depending on the look you want to achieve and the type of fabric you are using. You shouldn't make too wide of a withdrawn area, as your Gigliuccio can be difficult to control. Now we return to do the second part which is a combination of Punto Quadro and the Gigliuccio. 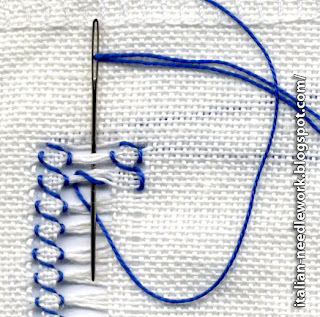 Notice that the needle goes behind the bundles but in front of the thread of the loop - this is important! Now go back and wrap the second bundle taking care not to not to pass through the loop you are making but under it - we're not creating another knot, just a wrap. When this is done, your knot should have moved slightly to the right and into the half-way position of the open area. We must wrap the second bundle one more time to complete the third leg of the Punto Quadro. 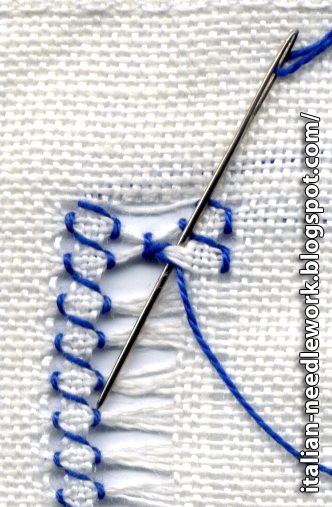 Again, be careful not to pass the needle through the loop you are forming. 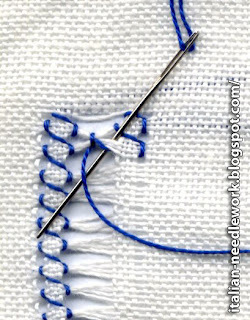 You can nudge the stitch down to the right-hand edge of the open area to make it level with the third leg of the previously done Punto Quadro. 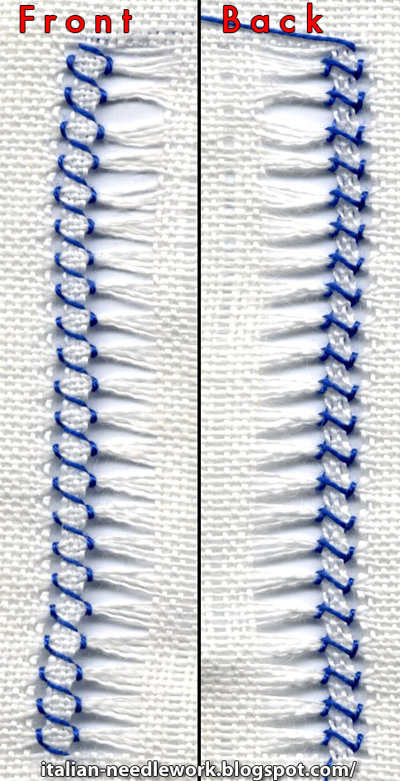 This a double row of Gigliuccio with a hem (which is secured with a separate row of Simple Hemstitching). To use it to secure a hem, it is executed on the back side of the work, check out this tutorial for the first part and this tutorial for the second part. I received an intriguing email some weeks ago from Enza Termine of Sicily. You may remember her from a previous post on circular netting. 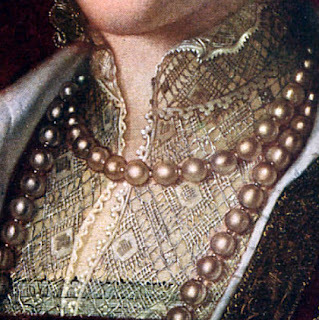 Enza had come across a web page by an SCA member who was investigating Mezza Mandolina, a more complex type of netting or Lacis evidenced in a portrait by Bronzino of Eleonora, wife of Cosimo I de' Medici and another portrait of Elizabeth I of England. Both portraits date to the mid-to-late sixteenth century. 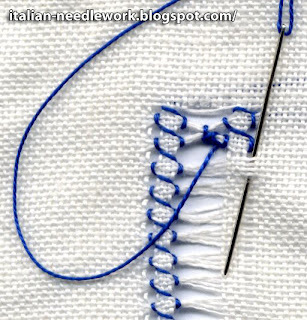 Enza had also found this page with Mezza Mandolina tutorials by the same SCA member for different patterns that she had been able to figure out by experimentation. 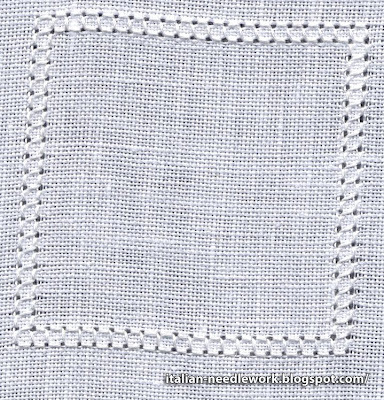 "There is a variety of mesh-work very seldom found existing now, although several designs for its manufacture are to be seen in an old pattern-book, Isabella Parasole's Studio delle virtuose Donne published in 1597; the work was known as mezza mandolina, and is a net of irregular mesh, sometimes left plain, but more often embroidered with little leaves in matting-stitch which fill the square mesh and join it to the others so that the background can hardly be seen between the interwoven figures." In my researching I found that all texts cite Parasole in one text or another of hers. Unfortunately extant Parasole texts are extremely rare and while out of copyright, are part of private and museum collections and are not yet in the public domain. The German version of a 1616 text can be found here but there are no patterns for Mezza Mandolina. One librarian at the Smithsonian Museum told me that they plan to scan their rare texts and put them online in the future, this is exciting as they have four Parasole texts in their collections. 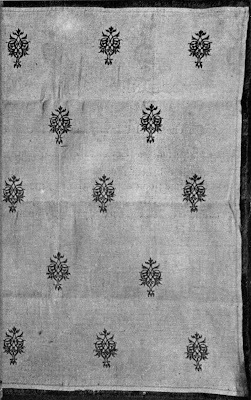 The tiny text Origine ed uso delle Trine a Refe has a rather complex pattern for embroidering Mezza Mandolina from Parasole's Pretiosa gemma delle virtuose donne, reprinted by Luchino Gargano in Venice, 1600 - you can see it here. I'm not sure how you would manage something so complex on netting but then, I don't have any experience in doing it! 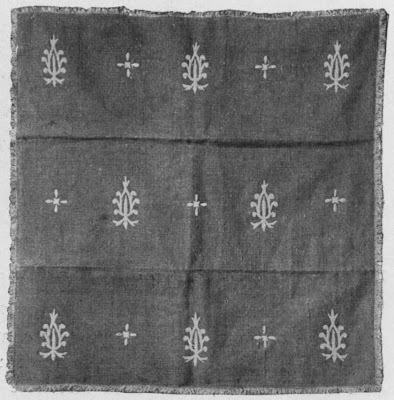 She has written of her adventures on her website (click on Mezza Mandolina - text in Italian) and she also found this extant example of Mezza Mandolina from the late 19th century in the National Museum of Abruzzo. Does anyone know anything else about Mezza Mandolina? Please leave a comment below. Thanks to Enza for sharing her photo and adventures with us! To read a follow-up post for this subject, click here. 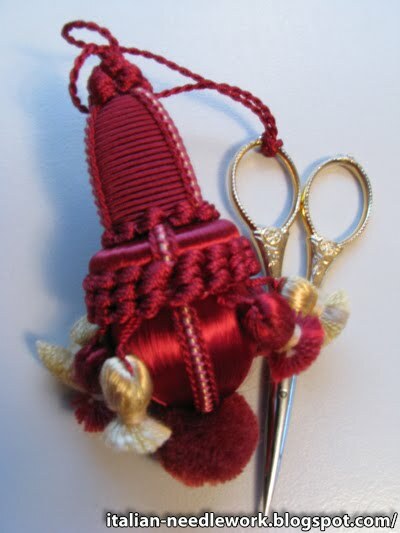 I've been asked about some quickie Italian needlework Ornaments. For those who are still playing beat the clock before the Holidays to get some ornaments done, here is a great suggestion from Barbara in Modena. 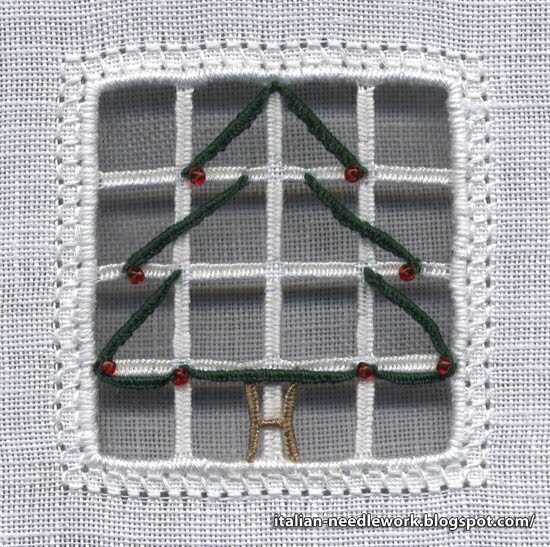 Barbara has taken some simple Punto Antico designs from Bruna Gubbini's Punto Antico books and changed the colours to represent the Holidays. 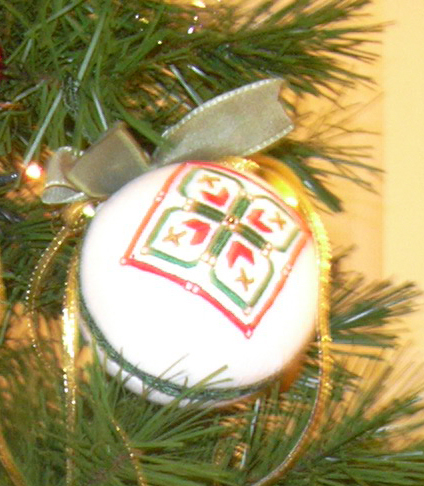 Then she's covered styrofoam balls with the stitching and trimmed them with decorative ribbon, passementerie, etc. 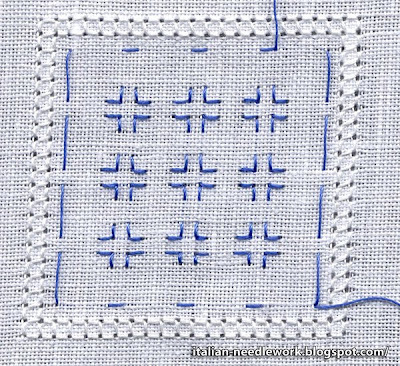 You can check out the tutorial she has written for Tuttoricamo. (Click on the British flag for the English pages then on the left side of the homepage, click on "Arts", then "Christmas Decorations". 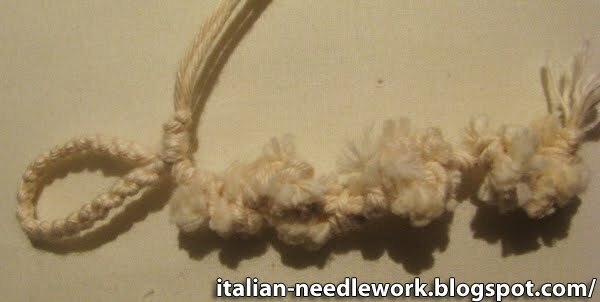 As I have mentioned before, in the later 19th and early 20th centuries there was an Arts and Crafts movement among the embroiderers and lacemakers of Italy. 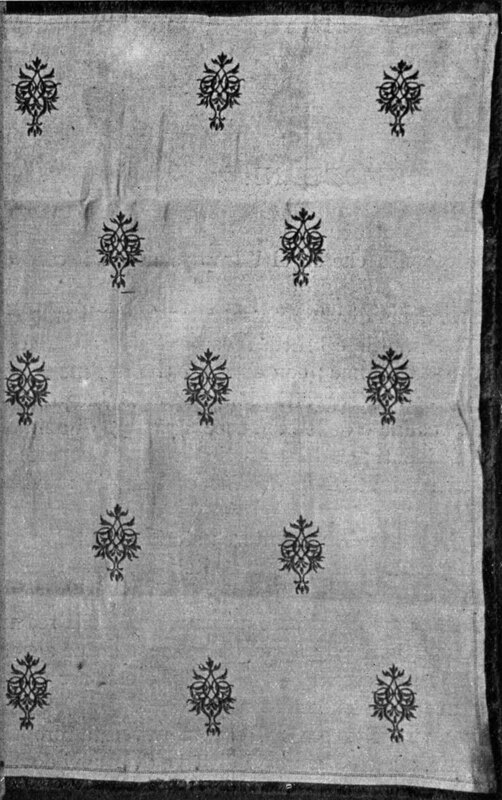 Many regions recovered lost needlework techniques or invented new ones and above all sought to provide a means of support for local women through the sale of their needlework. Urbino was no exception and the association named Feltria Ars took inspiration from the local paintings, frescos and artwork to produce their unique needlework during this period. 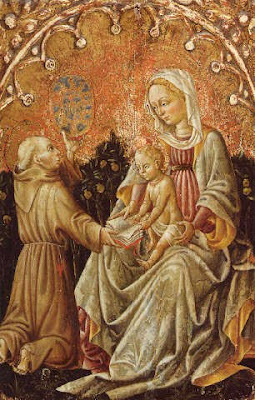 "In Urbino a young lady of the aristocracy wanted to give work to the women of the area and gathered around her other ladies who helped voluntarily. 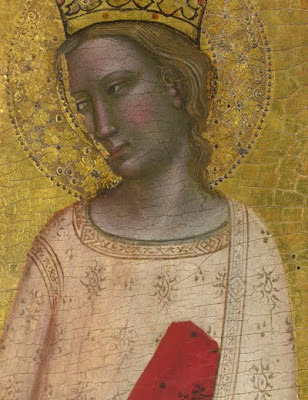 The designs and inspirations for the new embroideries were taken from [the works of] Allegretto Nuzi, the brothers from San Severino and Antonio Alberti which offered thousands of little motifs, adorable for their freshness and grace, which adorned the clothing, drapery and halos of their saints." 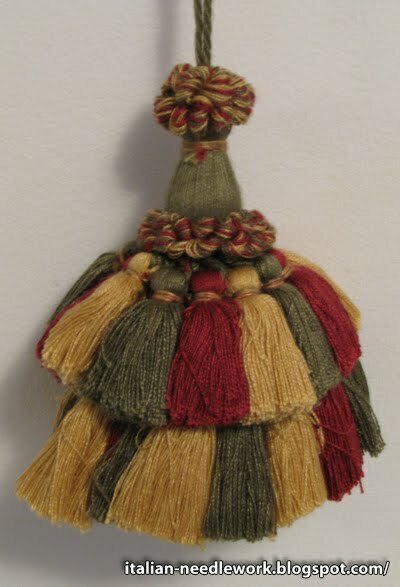 The Feltria Ars association also "embroidered with coloured straw with which they made unique tassels" to quote Lucia Petrali Castaldi in her book Dizionario Enciclopedico di Lavoro Femminili. 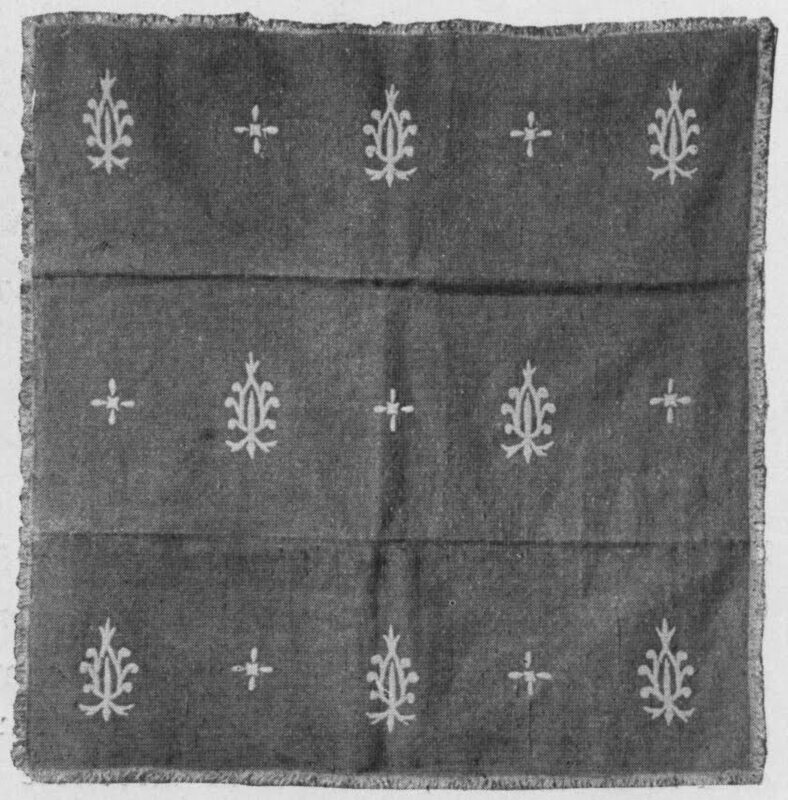 She also writes that the most important artistic handiworks to come from Feltria Ars were their hand-stamped fabrics using stamps from the 15th and 16th centuries. I am unable to find out anything further on Feltria Ars or who the "young lady of the aristocracy" was who started it all. If you know anything will you post a comment below? The history of Passementarie is hard to follow. The term itself can mean so many different things: braids, cording, ribbons, tassels, gimp, fringe and more. There is evidence of Passementarie in ancient Egyptian tomb paintings and in ancient Chinese, Japanese and Roman legends as well. 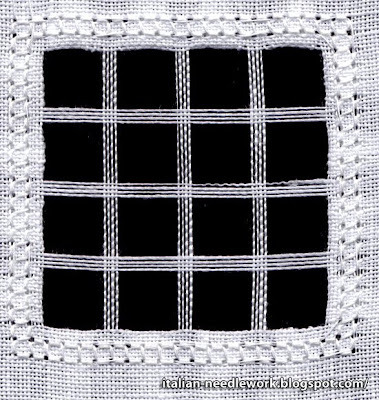 Some historians think that elaborate braided Passementarie were the beginnings of Bobbin Lace. 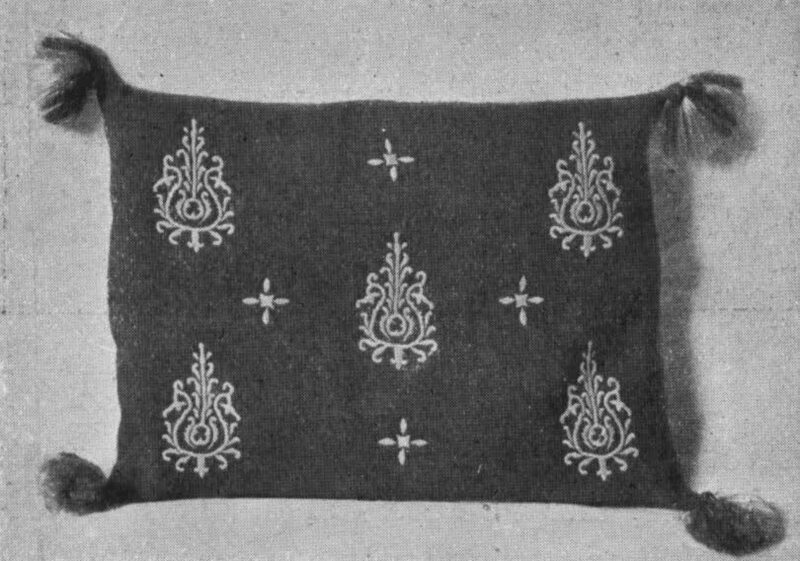 Most European countries have history of a different era where both clothing and interior decorating were embellished with Passementarie according to the fashion of the time and place. In old texts, you'll find it under different names: Passaments (English), Passamani (Italian) stemming from the French term Passementarie which is widely used today. During the Middle Ages and beyond in Europe, there were guilds for Passementarie shops and it was considered an art form (as is the handmade Passementarie of today) requiring years of apprenticeship. Long trims were executed on pillows (like lacemaking) or with complex hand-operated machinery. To see many technical illustrations from Diderot & d'Alembert's Encyclopedia (18th century) regarding Passementarie, click here. In a previous post I told you about a Passementarie shop that I went into in Florence, where they make a lot of what they sell by hand. Here are only a couple of tassels that I got there. Not the best photos, I seem to be very shaky today, but you get the idea of the intricacy of the work. There are still many Passementarie shops in Italy and it's fun to check them out as they are full of all manner of trimmings which, if you are fortunate, are handmade and therefore so much more interesting than the coldness of the machine-made stuff. It takes a certain talent with colour and design to make beautiful Passementarie. "The Milan stitch is a type of needle made braid generally used in passementarie to cover (in silk or cotton) the head of tassels (see photo) but also buttons, accessories and weapons, the name probably comes from here (as the production of competition weapons was one of the principle industries of Milan). Widely used in the 18th century, counting the numerous [extant] examples from the first half of the following century, it then slowly fell into disuse and we completely lose the technique. This group is formed with the precise intent of recovering that technique. Anyone who has news or knows enthusiasts and experts in the field of passementarie is asked to put them in contact with this group or me via email. 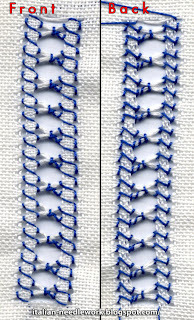 In the photos are also a few pages of a French book on passementarie in which a similar stitch is shown and explained. 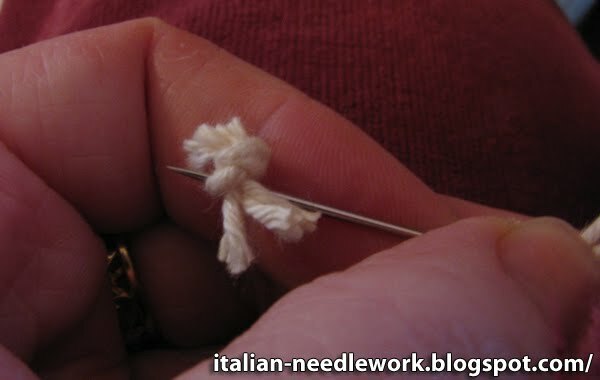 Anyone - an enthusiast of braiding - who would like to try to figure out the technique of the 'Milan Stitch' from those instructions and is successful will have eternal gratitude and a substantial reward. 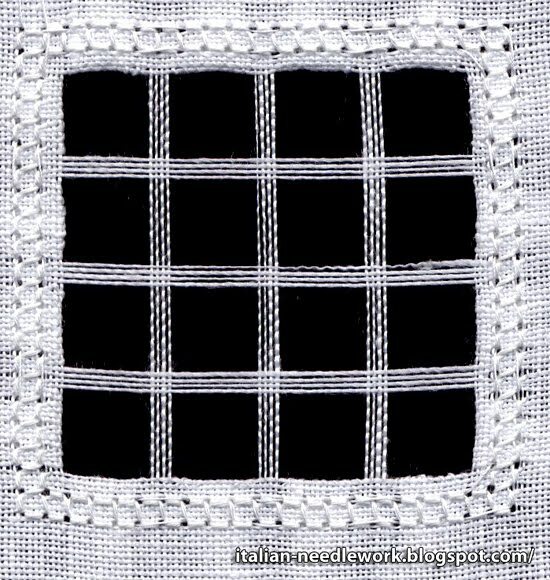 Unidentified sources claim that certain Berber tribes from Morocco cover buttons with a braiding that is similar to the 'Milan Stitch'. Research of this lead is made all the more difficult as these are nomadic tribes. Therefore, on one hand it is difficult to trace them and on the other hand, if you did have such luck [as to find them] you would have to follow them across the desert in order to have them teach you the technique, with all the linguistic and logistic difficulties involved." Since this post was left on April 16, 2009, no one seems to have helped this group achieve their goal. What do you think? Can anyone help? 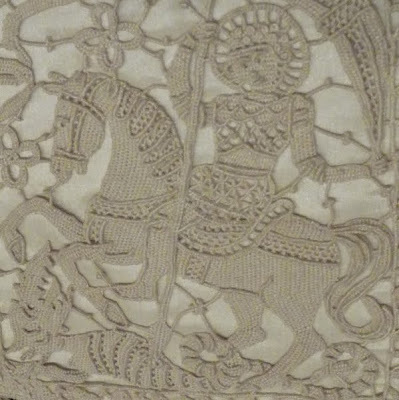 St. George and the Dragon is a popular theme in needlework, I've seen them rendered many times. I wanted to show you this exquisite little bag from the Poldi Pezzoli Museum in Milan made of needle lace stitches. The bag has many things to look at, from the motifs around the edges to the painstaking detail of all three figures and don't miss those knotted tassels! I love St. George's curly hair and the detail on his armour and the Dragon is really something frightening but the horse is pure magnificence! 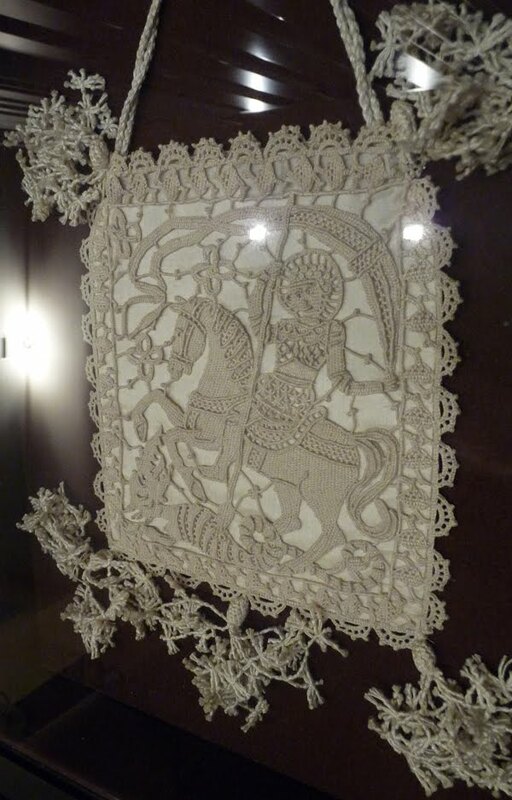 If you can get to the Poldi Pezzoli Museum, don't miss the Lace Room and the Textiles Room! Two of the museum's latest acquisitions are baby bonnets, both richly embroidered. Sincere thanks to Stefania for the photos! Someone was asking if there were any freebie Reticello patterns available that could be used for Christmas tree ornaments. 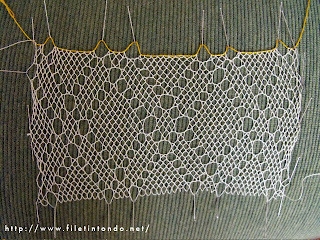 Laura of Ricamiamo Insieme in Milan has 6 exquisite little Reticello freebies on her website. I didn't think them for beginners (which I am) but I decided to try to do one anyway to see how well it turned out. 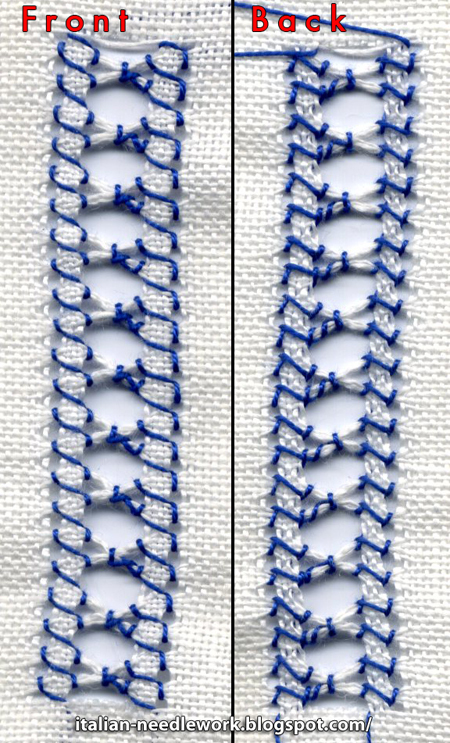 I feel pretty good about the framework preparation but you will see that my stitching leaves a bit to be desired. Before we get started I have to say that this is how I executed the work and not how Laura or anyone else teaches it. This is strictly my own interpretation using the resources that I have. That said, Laura does teach Reticello if you live anywhere near her, or there are a number of good books on the subject if you're not in Italy. For books, check out my Library page or check out "Reticello" under the Labels heading on the homepage of this blog for a number of posts on Reticello. I used 40 ct Giori linen called Cupolone for this project because a very kind person sent me quite a long strip of it some years ago. I'm not sure that Giori is still producing this linen as I have heard rumours that they have closed. Their website is still up so I'm really not sure what the story is. 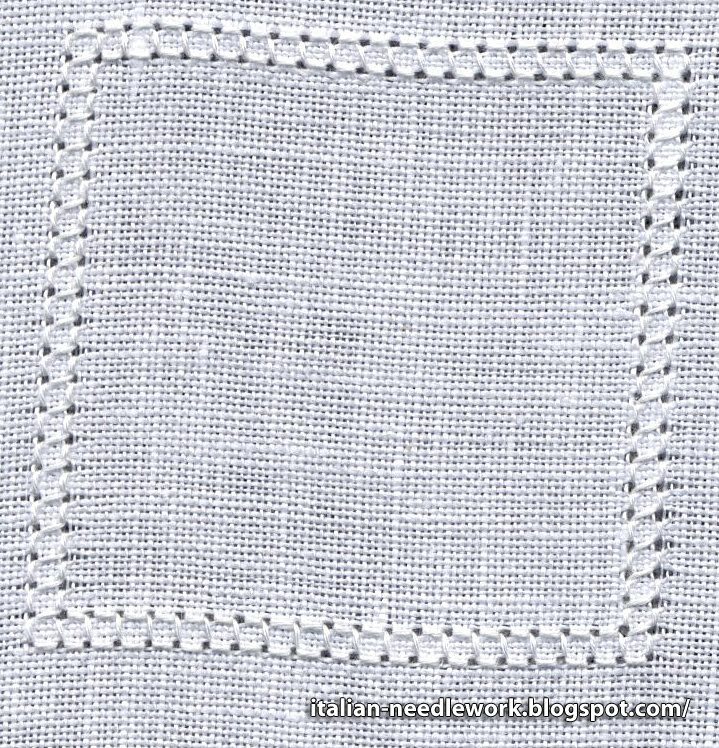 Anyway, a compact, high count linen is good to use. 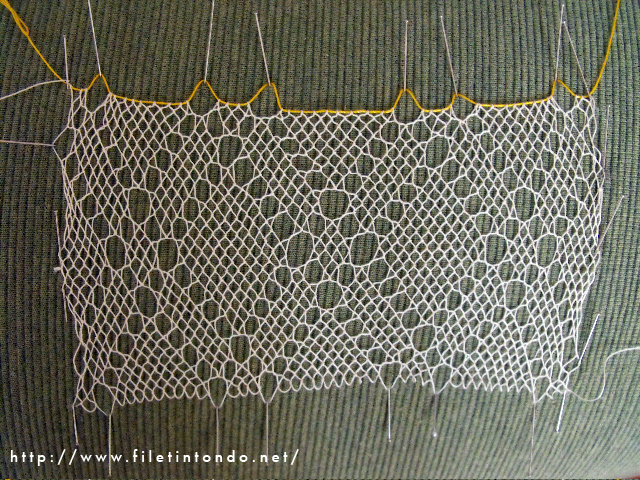 I also used DMC Coton a Broder thread, weights 30 and 35 for making the framework (if you don't have any, use Pearl Cotton nos. 8 and 12) and Soie d'Alger silk thread and Mill Hill beads for the design. 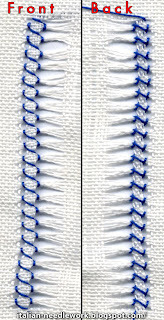 Then the cut threads are folded to the backside and basted down. 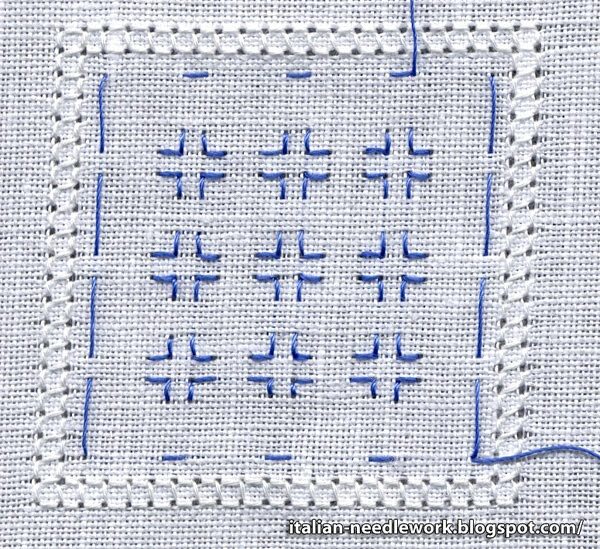 This gives a much cleaner edge than Hardanger and we will overcast around the square when everything else is done. Basting them down keeps them out of the way so they don't get tangled up with other threads or accidentally pulled out or cut during the working process. Here is where I tread into unknown territory. 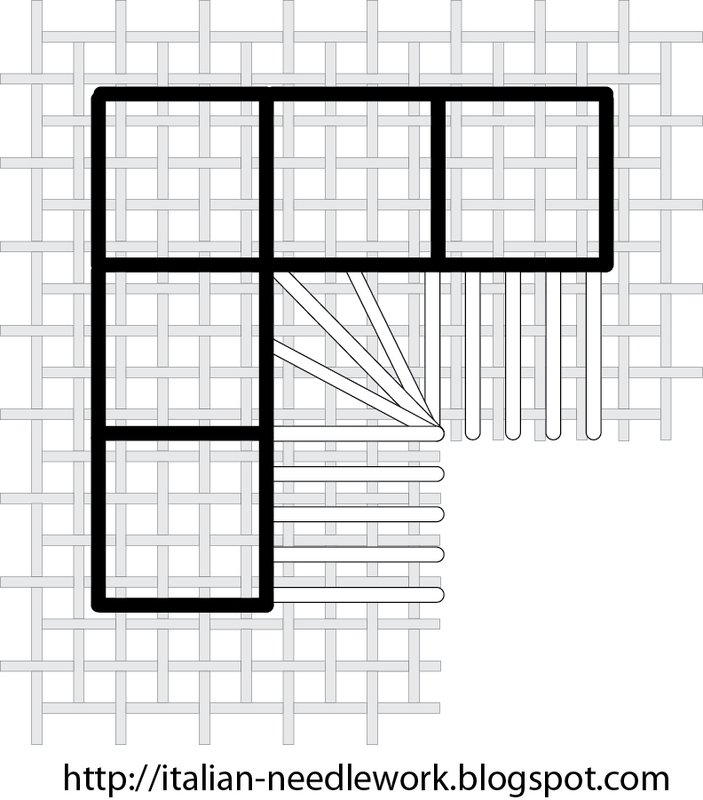 I tried several threads before settling on the Soie d'Alger. Even now, I'm not crazy about it but my bars were starting to show wear from all the unpicking that I was doing so I decided to carry on with the silk. I only used one strand but I'm thinking that two would have been better. After you have finished your overcasting then you can trim away (on the backside) the excess threads that you folded over and remove your basting. Many thanks to Laura for the fantastic Reticello ornament freebies! If you've got some tips for better execution – they are appreciated! Please leave them below in the Comments section. If I hadn't unpicked several times, I think I could have done the whole thing in a couple of days, or even one long Saturday so there is still time before the Holidays to try these out! All this talk of tassels made me remember that I had started a tutorial on a Macramé tassel handle back in September and didn't finish it. 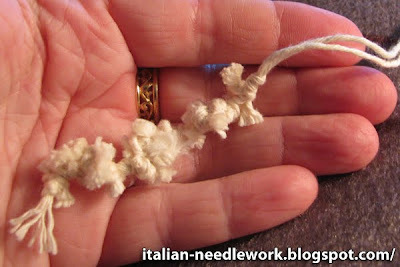 Anna Maria from the Accademia Punto Assisi showed me a neat way to do a handle for a tassel using an Alternating Half Hitch Knot when we were at the EGA Seminar in San Francisco. 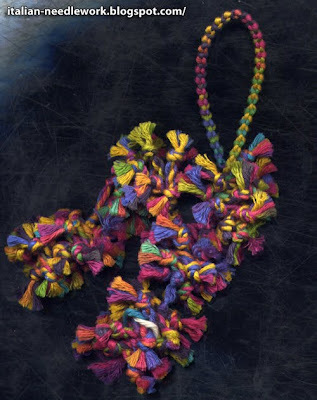 I had to try it out right away and used the pieces of yarn hanging from my suitcase handle to reproduce the knot so I wouldn't forget. 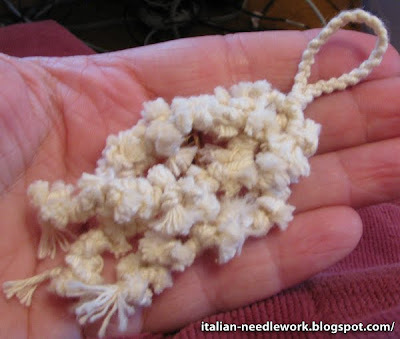 Later at home I did a little tassel using single knots for the fluffy parts and did the Macramé handle. I was going to add more legs and then I got distracted by something else and it has sat on my side table for a couple of months now. The hardest part was remembering to alternate! Once the Macramé was long enough, I knotted it into a loop for the handle and continued on attaching my pieces on to the second leg. Then I added a third leg by knotting it on just under the handle. I want to add at least two more legs to this tassel but you get the idea.